Westbrook is a suburb of Portland with a population of over 17,000 people. The city has a total area of 17.33 square miles. It is served by interstate 95, U.S. Route 302 and State Routes 22 and 25. 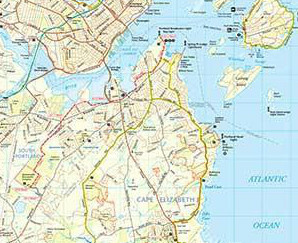 It is bordered by Portland to the East, South Portland and Scarborough to the South, Gorham and Windham to the west, and Falmouth to the North. Westbrook has over 35 miles of watercourses and approximately 30 acres of ponds. The Presumpscot and Stroudwater Rivers and Mill Brook are significant water bodies that define Westbrook's character. Westbrook was once known as a mill town and these rivers provided water power for the early mills within the city. Westbrook is a great mix of city and country. Now Primarily a suburb of the larger city of Portland, Westbrook itself had a growing business base and developing core downtown district. IDEXX Laboratories, a multi-national corporation, is headquartered in Westbrook. In addition to the downtown area, many of the city's businesses are located with two industrial parks as well as ion the area surrounding the Maine Turnpike Exit 48. There are also large tracts of undeveloped land in Westbrook that are known to included natural resources such as deer wintering areas, wetland and other corridors that have been recognized as important to the community. Listing courtesy of Maineland Real Estate. Listing courtesy of Kre Brokerage Group. Courtesy of Worth Real Estate, Inc. Listing courtesy of Worth Real Estate, Inc..